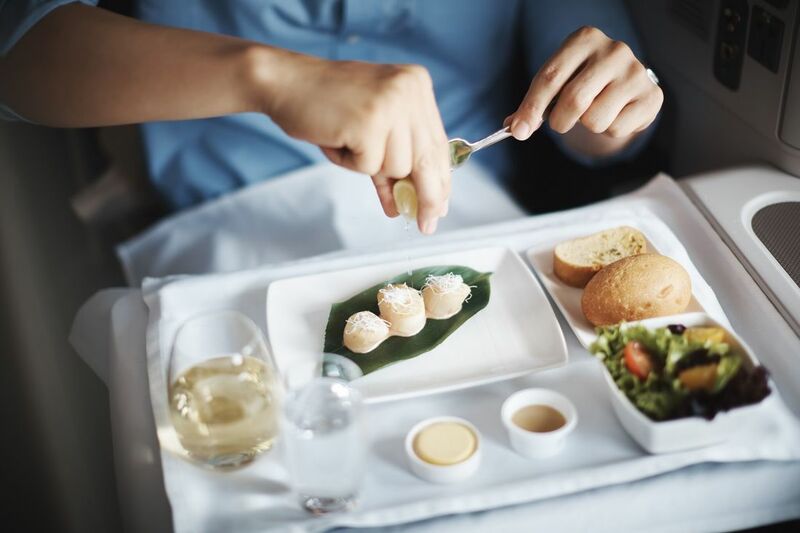 Cathay Pacific has made impressive changes to what it describes as ‘a new style of Business dining’ – and Perth-based features editor, John Newton, was more than eager to sample on a recent B777-300ER Paris Charles de Gaulle-Hong Kong flight. The airline’s business class menu has improved out of sight. And so, too, has service and food, which is now individually plated and brought to passengers by hand instead of by trolley. And Cathay’s new eight-page newspaper-style broadsheet simply called – The Menu – has a mouth-watering range of dishes to rave about accompanied by fine French, Australian and South African wines. The Menu sets out not only the flight meals and drinks, but for wine aficionados there are in-depth articles on the Syrah grape, ‘hidden gems’ in Hong Kong, plus the latest new and interesting places on the Hong Kong dining scene. 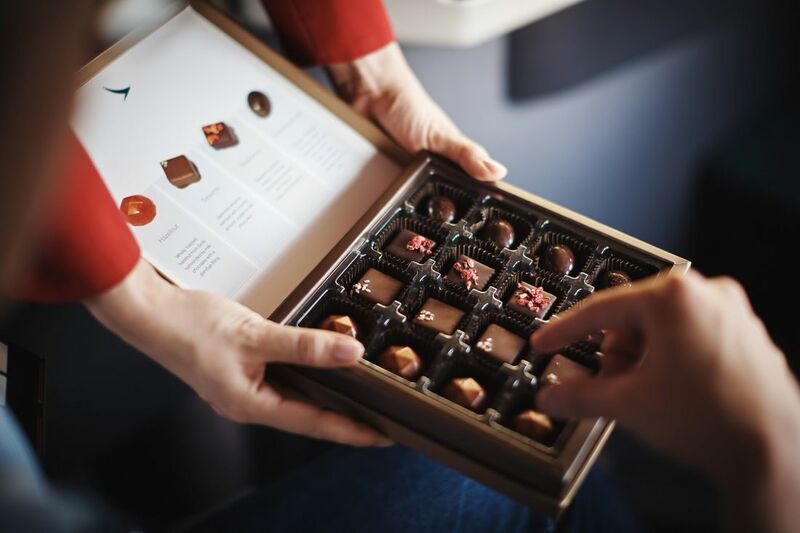 But it’s the eye-catching menu itself that inspires, with up to six main course choices on flights over 10 hours to destinations such as Paris, London and Madrid. And for the diet-conscious, there are well-being options. Next February, Cathy’s new-look business class dining concept will include Auckland and Sydney, while Adelaide, Brisbane, Cairns, Melbourne and Perth flights are on the radar for May 2019. From Paris Charles de Gaulle, the airline served either an express lunch, comprising a starter of walnut/Viennese milk bread, followed by pearl barley salad, made up of dried apricot, asparagus, sun-dried tomato and creamy balsamic dressing, then lemon posset. The full lunch starter choice was orange and tarragon smoked salmon, with apple, radish and pumpkin salad; or chicken with sesame dressing or fennel and celery cream soup. Main courses, among other things, were: cod with chilli bean paste, broccoli and steamed jasmine rice; braised beef chuck with red wine sauce, grilled zucchini, eggplant and potato gratin; gnocchi with lemon thyme sauce, green peas spinach and oven-dried cherry tomatoes; shrimp wontons, with noodles in soup. To finish, there was a cheese plate selection; lemon posset, ice cream selection and seasonal fresh fruits. Piper-Heidsieck Cuvee Brut was served before take-off – and afterwards, while white wine devotees could choose from Louis Latour Grand Ardeche Chardonnay IGP 2015 or South Africa’s Helderberg Winery Sauvignon Blanc Stellenbosch 2017. An Australian gem from the Barossa Valley - Elderton’s 2015 Shiraz - and a French Chateau La Haute Claymore Lussac from Saint-Emilion were top-drawer red wines. Snacks, such as sun-dried tomato bites, mocha shortbread and Cathay’s signature burger, were available in the galley during the flight. Before landing, there was an express breakfast of warm pastry selection served with a choice of beverage, while the traditional breakfast was a choice of Chinese, Western or Continental. 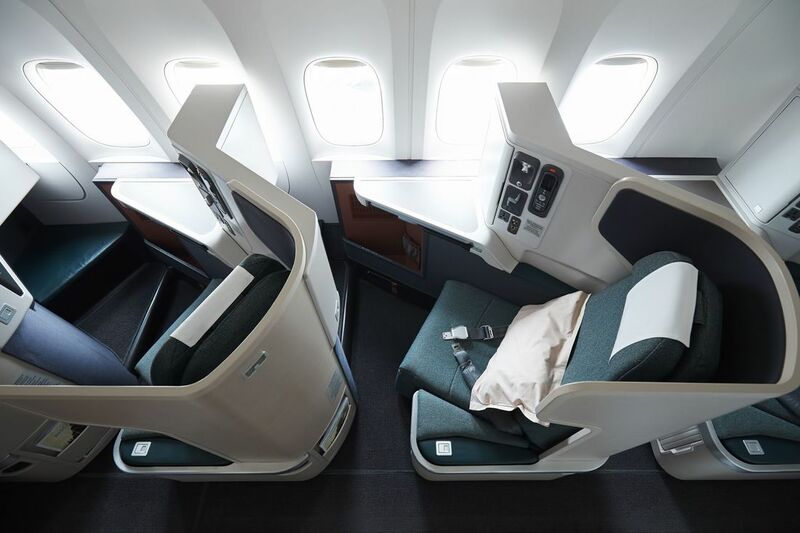 Cathay’s B777-300 business class seats in a 1-2-1 configuration change position at the touch of a button. They have a generous seat width of almost 54 centimetres (21 inches) – a fraction more than the same class seats on its other aircraft, A350-900, -1000 and Airbus A330s.The award-winning fully-flat bed seats have two pre-set settings for sitting and sleeping, as well as controls for smaller adjustments. Business class amenity kits feature, among other things, skincare products made from organic ingredients found in South Australia’s Adelaide Hills. These include hand cream, facial moisturizer and lip balm. 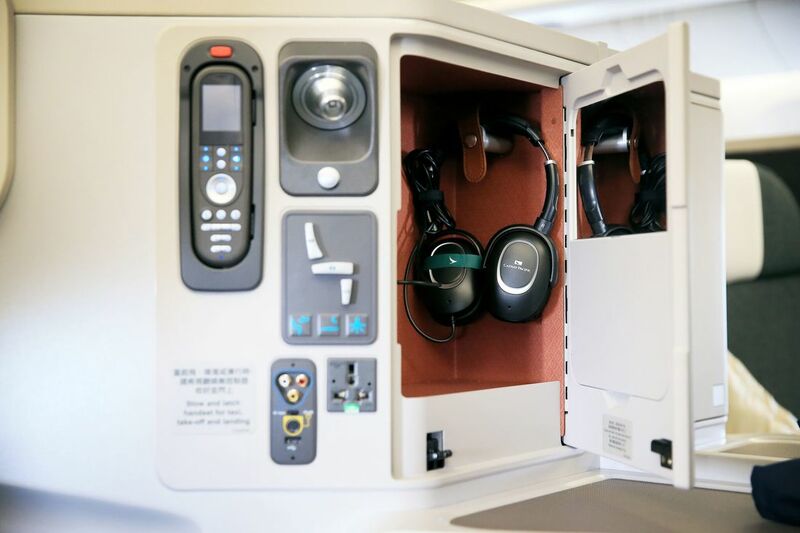 A locker close to the seat contains bottled water and noise-cancelling headphones – plus there also places to secure your drinks. 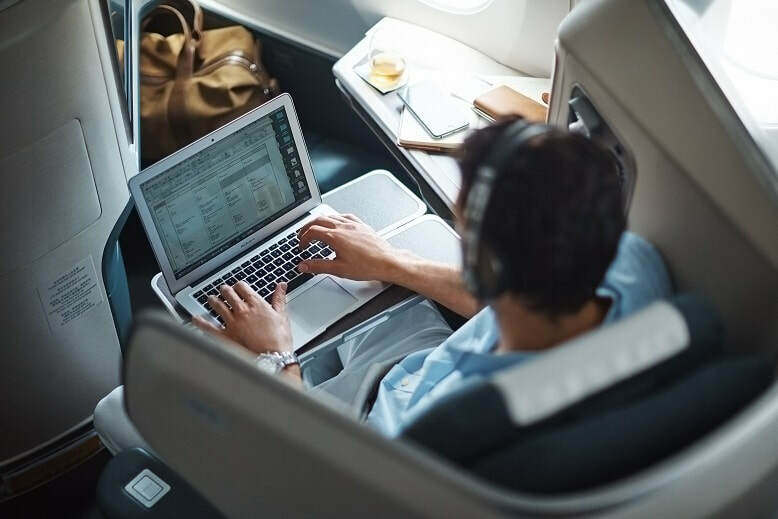 Cathay’s inflight entertainment schedule is updated monthly and includes the latest movies, television series, and music to stream throughout the flight. The airline also has a new inflight well-being programme called ‘Travel Well with Yoga’. For business class passengers travelling back from Hong Kong to Australia (or anywhere else, for that matter), Cathay’s hub has seven lounges - five business class and two first class. The newest lounge – The Deck, opened last March, seats up to 180 passengers and covers an area of more than 800 square metres. It's more than 45 years ago since I first stepped aboard a Cathay Pacific flight when the journey took a lot longer and the aircraft weren't as sophisticated as they are today. It was a Convair 880 (CV880) that flew from Perth to Hong Kong via Jakarta and Kula Lumpur - a far cry from my latest Cathay experience on a direct Perth-Hong Kong flight on the airline's new Airbus A350-900 aircraft. 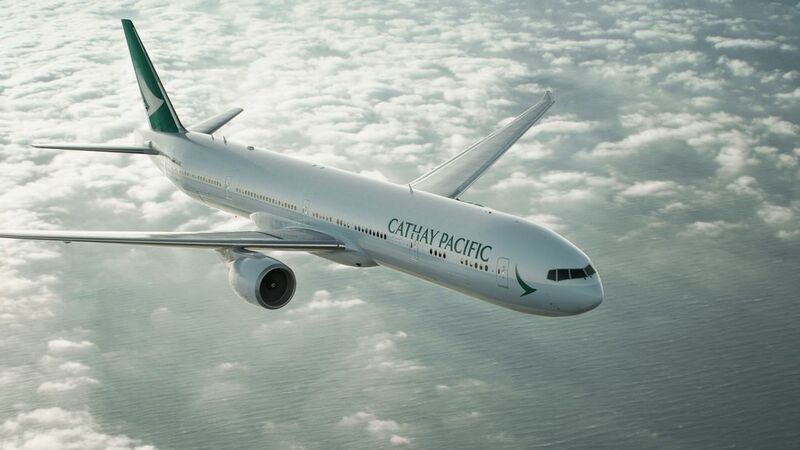 Bucking the trend of its major competitors, Cathay Pacific didn’t invest in the giant Airbus double-deck A380s – preferring to remain faithful to Boeing and the airline’s fleet of B777s. These have now been joined by Airbus A350-900 and -1000 aircraft on the airline’s long-haul routes, which have spearheaded the airline to new heights, with a supreme quality of service to more than match the much over-rated Middle East carriers. Cathay’s business class lounge at Charles de Gaulle is impressive, to say the least. It overlooks the main runways and offers premium French wines, a top selection of spirits and hot meals and vegetarian and cold dishes. Get there early!